The more I read about hauntings and discuss hauntings the more I have come to believe that hauntings fall into very similar categories and types. I am open to disagreement on this subject, but it seems to me that no matter where you are in the world most hauntings fall into one of several categories. In psychology I am not much of a Jungian. I tend to be a cognitive behaviorist, but when I read about folklore and even when I hear ghost stories that are true ghost stories, I hear patterns in them that correspond a little with Jung's archetypes. Carl Jung was an early psychologist who believed in something called a collective unconscious. He believed all people drew their thoughts from a similar source and this accounted for why people from every different culture had myths and stories that were very similar without ever having known each other. For example; most cultures have a dragon myth and a Cinderella story. He also believed we all had universal symbols that we use to interpret the world. Jung's main archetypes included the Great Mother, the wise old man, the child, the beautiful woman, the devil, the trickster, the scarecrow, and the shadow. These archetypes symbolize core desires within us. I think many of the hauntings I've explored fall into similar archetypes as these and I'm going to break down and explain some of these hauntings. The White Lady Ghost Story: These are some of the most common ghost stories. There are also green lady and grey lady ghost stories that follow the similar pattern of a beautiful young woman, often betrayed or hurt in love, who somehow dies and leaves a tragic ghost behind. This would fit into Jung's beautiful woman archetype. Poltergeists: Poltergeist literally means noisy ghost. It is a haunting that causes much commotion. Objects move and break and are thrown about. Many people now believe that poltergeist hauntings are somehow connected to one person. This person is usually an adolescent going through great turmoil. Some believe it is the adolescent themselves who is causing the haunting. This type of haunting conforms to Jung's trickster archetype. The haunting is caused by one person who is causing a lot of commotion. Loki would love it. The Crying Child: I've seen a lot of this type of haunting around bridges. Almost every town in Alabama has a cry baby hollow ghost story. I've also seen weeping children in houses and buildings. Usually, the child has a sad story and their crying ghost is the lingering remnant of their tragedy. This conforms to Jung's child archetype. Demons: I don't hear these ghost stories often but when I do they are the most horrifying and terrifying ghost stories. I've had several people tell me stories about being tormented by a hostile spirit of some kind who is clearly malevolent and will often work to cause bodily harm against the person they are tormenting. This conforms to Jung's devil archetype. The Guardian Ghost: I've heard many stories about helpful ghosts. These ghosts usually begin as a classic haunting but when trouble arises they are quick to help. These ghosts would fit the great mother archetype. The Classic Haunting: The classic haunting is the most typical ghost story. Someone has died in a house or building a piece of them remains. They are usually attached to the building itself and have some connection to the location for some reason or another. These hauntings would fit into Jung's shadow archetype. They are the opposite of the rational self. They are the unexplainable things that connect us to the other side and chaos. I'm not entirely sure why haunting types seem to fit so neatly into the Jungian archetypes. Jung himself would argue that this is just more proof of his theoretical collective unconscious and his belief that ghosts represent some part of our core desires. I'm not to sure about that. Maybe there is something that connects us all in life and in death and draws us to similar stories and places, but I think it more the part of what makes us human than some outside consciousness. I would tend to believe his theories on core desires would come closer to the truth in this matter. Whatever the cause, it is fun to look at ghost stories like this. I may not agree with Jung much but his way of looking at the world certainly hits home in many instances. The painting above is by an artist named Renee Gandy. This paintings name is Shadow Archetype. 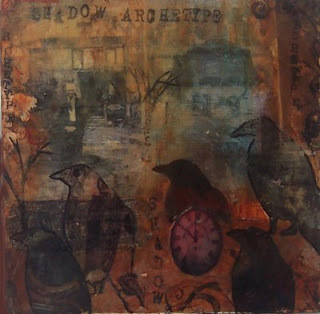 You can find her work at http://fauvestudio.blogspot.com/2009/07/shadow-archetype.html. Her work is also available on Etsy. I haven't read much Jung, but I have run across articles about him and Tarot. WOW! I like how you looked at this and laid it out. Very interesting and well thought out. I also liked how you tied it in with your job background. Clever! Thanks for the link Paledmother! Courtney and Pam: Thanks. I didn't realize how much it went together until I started to write it out. I ran across a classification system for American folklore in my research, but I can't locate anything about it now. I think the book was written in the 60s or 70s, but I can't recall a title or anything else. Rosemary Ellen Guiley may have something about it in her Encyclopedia of Ghosts, I'll check when I get back home. There are a few other types that fit into your system: the vanishing hitchiker, the evil innkeepers who kill and rob their clients, the man who tried to outrace the devil, the spook hill phenomenon where a car is pushed up a hill by unseen forces, the lovers united in death and the railroad ghost light which usually is related to a dead brakeman. While the book mentioned earlier concerned "folklore," I think it could be very interesting if this were to be updated to include modern theories of ghosts and hauntings. Jessica, you have absolutely the coolest blog and I love coming here. Thank you so much for continuing to post because you seem to get better all the time. This blog haunts me, appearing out of nowhere as it did just now, while I research the archetypes of hauntings. I am writing a paper on Shirley Jackson's "The Haunting" exploring my theory that source of some hauntings is actually collective-unconscoius projection from the human(s) experiencing it. If Eleanor is the Trickster, the source of poltergeist, the whole novel falls in place, at least for me. Your thoughts? I really enjoyed your article. I find myself thinking about horror in "archetypes" too; I don't really agree with anything Jung ever *believed* but I find most of his ideas fascinating in theory.